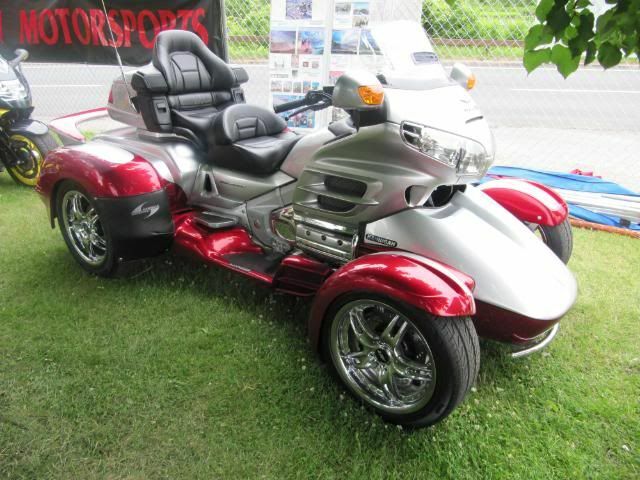 Goldwing fans are starting to understand how a trike should have been built in the first place. Imitation is the sincerest form of flattery, and we Spyder owners say welcome aboard !!!! 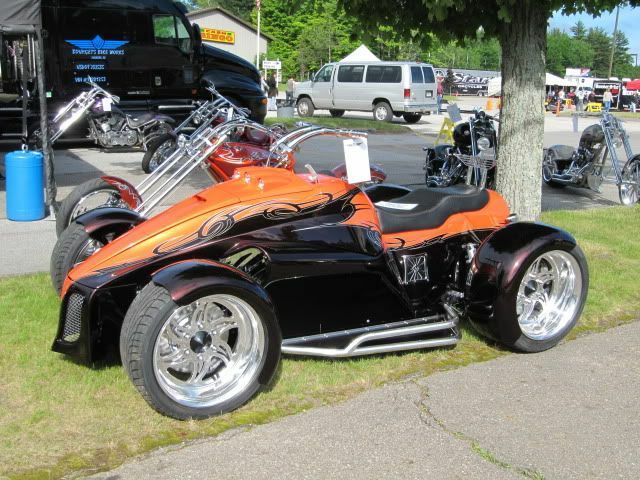 Hannigan Motorsports builds one similar. Or at least they did a few years ago. Had it on display at TourExpo at the beach. 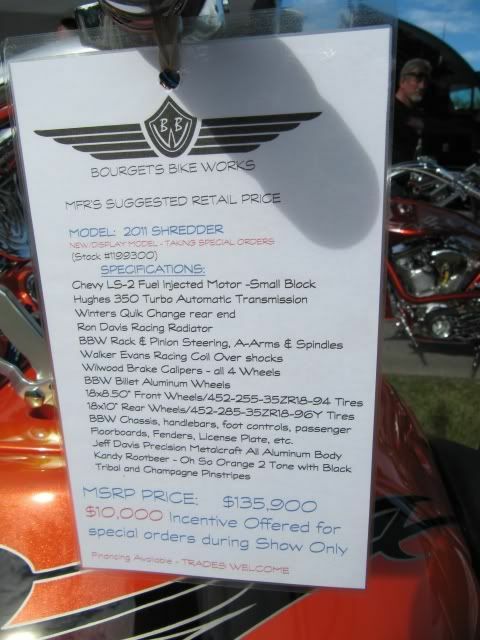 In fact, they had a GoldWing 1800 "quad" there too if I recall, a metallic blue one... and sold it to someone from NJ, according to RuthAnn Hannigan. I'm guessing Dave was just fooling around with some "experimental engineering." But it was for real. I can't imagine trying to get one of those registered though. It would be an eternal hassle. Hard to get an oversized, overpowered "ATV" licensed for street use, and I'm guessing that with the number of wheels (4) it would no longer be classified as a motorcycle (even though it's the same as a cycle with a Voyager kit or any other kind of "outrigger" wheels). But building one as a three-wheeler, regardless of which end the extra wheel is, it would be a novelty. 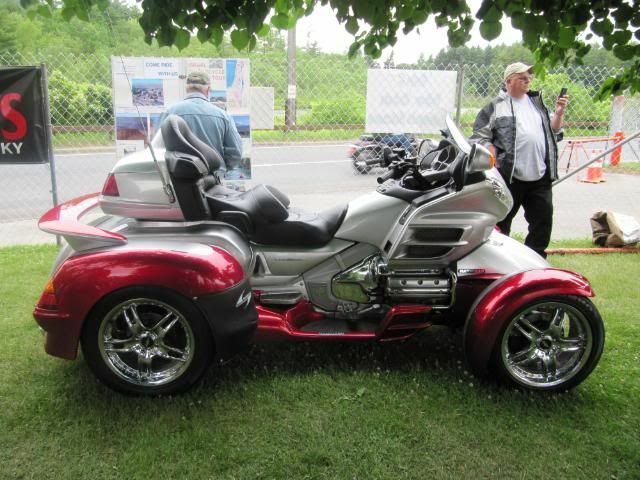 arntufun wrote: Goldwing fans are starting to understand how a trike should have been built in the first place. Hmmm? Would that be called a Hyder or a Sponder? How bout throwing a cargo trailer on it and callin it a TRansponder? Ohhhh, yeah... that's one of 'em. Looks pretty cool, but I don't think I'd relish riding it on them twisty mountain roads. Around town (if you were able to get it legal on the streets) you'd be hampered by the curious and inquisitive every time you tried to move it. Regular trikes draw enough of a crowd as their popularity has increased. I'm sure folks would swarm this thing in a parking space or gas station like bees in a hive. Fine if you need lots of attention, but a PITA otherwise. Hey WC, I am pretty sure Hannigan has toworry bout what to register it as whatever it is ..... I remember seeing em, and for the price, might as well get a loaded accord. the Spyderwing is interesting to me because I bet yah that sucker moves. I was disappointed with the Can Am RT. I know Fred and Cherrie will have my head for that, but I was extremely disappointed. And I wanted one too!! You might want to look at a Shredder. Those thing are SWEET. I would shred my credit limit with that thing. x-90 rider wrote: Here ya go WC. NOT able to register in Massachusetts - I checked (hubby said that's the only motorcycle he'd ride). Doesn't fit the Federal definition for a motorcycle or a car, so the best MA would allow is an ATV, and that's a bit too much $$ for riding through the woods, to me!! I called Hannigan to ask where it could be registered - they told me "anywhere you could get away with it". Yeah, that's helpful! Spiritdream wrote: "...I called Hannigan to ask where it could be registered - they told me "anywhere you could get away with it". Yeah, that's helpful!" You buy the motorcycle and register it. 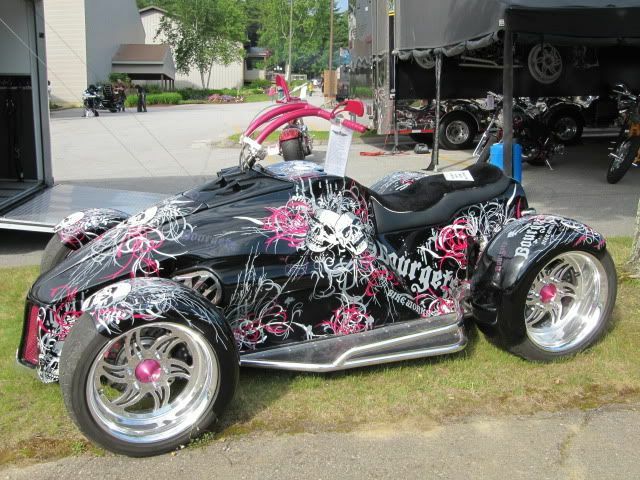 Then you have it converted to a conventional trike. It's already registered and tagged. Nobody asks any questions. THEN you take it back and have the REST of the modifications (two more wheels) done. One step at a time. Hmmmm. As long as you don't have to take it anywhere for inspection, it would only be a matter of answering a bunch of questions when anyone wanted to know. Thinking it one step further... there are many considerations being given for the special needs of our wounded veterans, especially those with mobility issues. I'm sure some soldiers, injured by IEDs and roadside bombs, who rode before leaving for the wars would want to ride again, and such a vehicle could be the answer for them. The government IS able to assist, once you get past the local bureaucrats. And if such a vehicle could be registered for them, why not others?